For well more than a century, being in New Orleans for Carnival Day and other cultural events has meant at least two things: seeing groups of African-Americans parading in spectacular regalia inspired by Native American motifs, and hearing an anthemic song that brings them together in good times and bad. The first recording of “Indian Red,” sometimes called “My Indian Red,” dates back to the 1940s, but the song’s history goes far deeper. “Indian Red” has as many variations as the Mardi Gras Indians themselves. Their tradition honors a friendship with Native Americans that some say dates back to slavery, when the two cultures are believed to have exchanged many kindnesses. 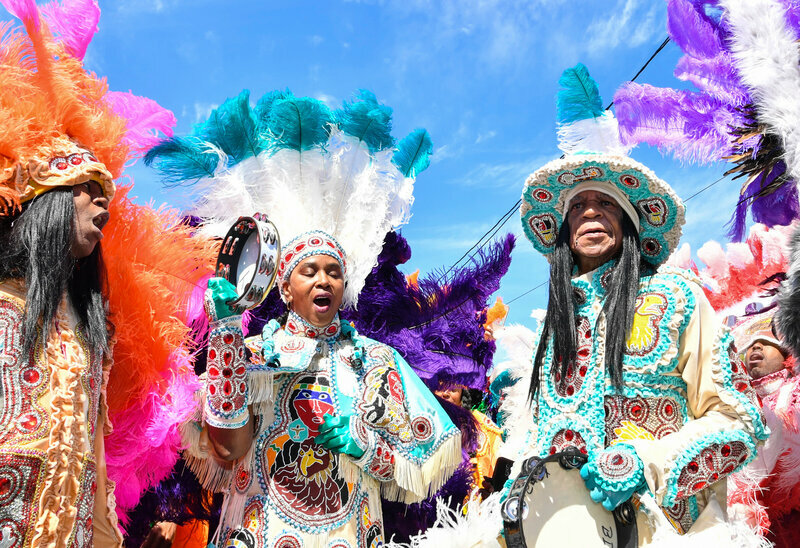 After Reconstruction, the Mardi Gras Indian tradition became more representative of the African-Americans who take part each year: an expression of self-love and self-pride, with an emphasis on African religious and cultural origins. Oliver Thomas, a former city councilman who now hosts a daily radio talk show in New Orleans, remembers following Mardi Gras Indian tribes as a child, each name as splendiferous as the next: The Yellow Pocahontas, the Ninth Ward Hunters, the Golden Eagles, Fi Yi Yi and many more.